In that process, private security employed by Dakota Access, LLC, a subsidiary of Energy Transfer Partners, deployed vicious attack dogs, pepper spray and physical assault against the water protectors. According to the most recent update, 6 water protectors were bitten by dogs, a dozen or more pepper sprayed and numerous were physically assaulted; which included women. "The only comment I have is that people trespassed and workers were hurt." stated an unidentified North Dakota State Trooper after the incident. When pressed about the use of excessive force and attack dogs by a private security firm, the trooper referred reporters to the Morton County Sheriff. This latest action comes one day after the Standing Rock Sioux Tribe submitted additional findings to the federal court to further support their case against the U.S. Army Corp of Engineers. Tribal historian Tim Mentz was invited to survey the property of a landowner whose land is in the pipeline corridor. In his statement to the court, Mentz states that his survey located at least 27 burials, 16 stone rings, 19 effigies and other features in or adjacent to the pipeline corridor. Mentz also stated that there are some features that are "unquestionably" eligible for listing under the National Historic Preservation Act. The call for support was made by a Lakota Vietnam combat veteran who happened to come upon the destruction of the sacred sites area, just one mile north of the encampment. We felt the need to protect these significant sacred and cultural sites on the land, because neither Dakota Access LLC or the U.S. federal government is not protecting them. Red Warrior Camp was nonviolent and unarmed throughout this action. We will remain nonviolent and unarmed. We ask supporters to do so as well. Additionally, we ask that supporters keep the attention on the fact that Energy Transfer Partners feels justified in using this level of force against unarmed and nonviolent water protectors AND the state officers that are sworn to protect the people allowed it. We are calling for ALL water warriors around the world to come stand with us. If you are not able to join us physically, we ask that you join us in prayer and commit to our Weeks of Global Solidarity Actions from September 3-17, 2016. All the major news outlets (Fox, CNN, nbc, cbs, abc, etc.) have not covered this story yet. Even the local papers (Bismarck Tribune, Grand Forks Gazette) give bias and false reports on this matter. The U.N. and ACLU (American Civil Liberties Union) advocated for the U.S. and the N.D. State gov't to make amends with the aboriginal tribes and yet nothing is done. 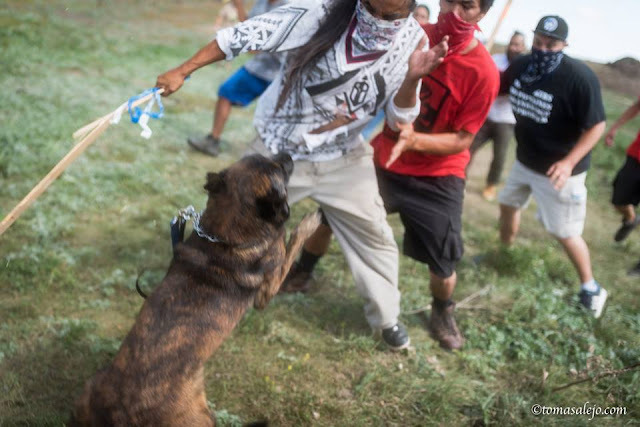 I don't understand how the DAPL Corp. can bring in their own security force with dogs and pepper spray, spraying everyone within range mind you, while the North Dakota Higway Patrol and Morton Co. officers are involved on site and again no support. Aren't they supposed to protect the people? The fossil fuel industry runs deep in this country, I say follow the money and the truth will be exposed. this is horrible...I am so disappointed with our Govt for ignoring this.. I am deeply praying that this will be stopped. It saddens me to see that our government and others of higher power think they can continue to take from others. Sending love and light and will pray daily and all day about this situation. Bush and the greedy oil sector of the economy WILL B WHAT BRINGS THIS COUNTRY DOWN,be it nature killing us off or the destruction of fresh water!!!! Were idiots that are frying from the sun yet keep on burning!!! Where are the Hollywood Native actors and their physical presence and https://www.gofundme.com/sacredstonecamp contributions and"star" fame in helping out at SACRED STONE Sacred Stone Camp??? I am a Caucasian Vietnam disabled vet, i will be there on Tuesday. I hope someone is getting the message out to the vet community. This is the same oppression our government and money grubbing scum used to over run the native Vietnamese people, killing millions, destroying their environment and leaving indelible scars on our veterans and the usa and of course the victimized native people of Vietnam. It is time for all, with any sense of morality, to attain solidarity. I'm driving from Chicago on Tuesday, will I be turned back by the brown shirts? I have a difficult time walking, will this be worthwhile? I want to know why the TV networks have not been notified, or have they? Get them there, we need the people of the United States to know of this, abuse, and misuse, of the D. P. A. L.
I will sign petitions and I will write a letter to the Whitehouse... And I will pray; A lot. Assault with a deadly weapon, premeditated, with intent to do bodily harm. Why hasn't anyone got lawyer's involved and public civil servers. ..police involved. I may just be a coconut from a small island, but I'd like to think I'm pretty akamai "smart" know what I'm talking about. Let's move it! Move it! Be proactive show your smarts not just your handmade signs. Everything Hitler did was legal. Lawyers? The legal system has been rigged against the Indians.Johnson v. M'Intosh/ the Doctrine of Discovery is white supremacist colonial law. If the legal system is unfair then you know what is your next course of action. I live in Winnipeg Canada and am disgusted by what is going on in the Dakotas.I visited Wounded Knee a few years ago with my friend who is Ojibway/Cree and was angered at that the fact that the memorial would not be there if the native people did not have a information booth set up there. The government would like us to forget but I hope we never will.I am Caucasian and grew up in an atmosphere of non prejudice. The media needs to get on this and fast. Despicable misuse and abuse of power...dishonor at it's highest level (supreme court) is a clear indication the U.S.A. is in the deepest kind of trouble. What kind of fool would be party to the enabling of this reckless endangerment of Water, our most precious resource? As I see it, those who put themselves in harms way to protect our Precious Oasis and Mother Earth from further destruction and desolation, represent what I feel are my deepest concerns, and I applaud your Courage and Decency..in Spirit and Gratitude, I am with you. Executive orders give our government the right to take over all control including energy pipelines... stand up everyone and show resistance against DAPL!!! Our Government is corrupt and most always has been. Our Government takes what it wants no matter the causes to others. We need to stand united and take control of our Government and stop all this corruption. We owe the Indians and we should be taking care of them and provide better for them. They deserve to have better than what was given to them.